The Gibson Custom Shop has announced their latest artist signature model, the Jimmy Page 'Number Two' Les Paul, billing it as a culmination of "the extreme efforts of Gibson’s Custom Shop and the intimate cooperation of Jimmy Page himself". According to Gibson, several hand-built prototypes were presented to Page. After he critiqued each one, refinements were made until the last prototype was given the master's blessing. This last prototype was the template that was taken into final production. 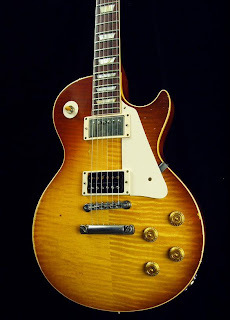 Legend has it that after Page received his first 'Number One' 1959 Les Paul -- a gift from Joe Walsh -- he started looking for a second '59 Les Paul. Purchasing 'Number Two' in 1973, he had the neck shaved down to more closely match the feel of 'Number One', which already had a slimmer shaved-down neck when he received it from Walsh. 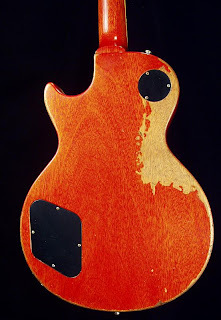 Gibson necks from the '50s were notoriously clubby and Gibson started to give their necks a slimmer profile in the 60s, no doubt due to customer feedback. In the 80's, Pagey decided to get the electronics of 'Number Two' extensively modified. He commissioned Steve Hoyland to devise a wiring system with push/pull pots on both volume controls and both tone controls and pickguard mounted switches, enabling a wider range of sounds via coil-splits, series/parallel and phase reversal of the pickups. Hoyland was also brought in as 'hands-on consultant' in duplicating the wiring in the new 'Number Two'. It's interesting to note that this exact push/pull switching system was implemented in the first Gibson Jimmy Page Les Paul Signature model from 1995. Personally when I tried out the mid-90's Page Signature, I found the switching system to be a hassle and actually took away from the gutsy Les Paul tone. The tone was thinner than a non-modified Les Paul, even with all knobs down and the guitar in 'standard' mode! A total of 325 'Number Two's' will be produced -- 25 guitars will be custom aged by Tom Murphy and played, inspected and signed by Page himeslf, 100 guitars will be custom aged sans signature and 200 instruments will receive Gibson's VOS (Vintage Original Spec) finish. Tom Murphy will be aging each guitar faithfully to match every scratch, ding and wear spot of the original Number Two. Judging from Murphy's replicated belt-buckle wear, we also get a good idea of how low Pagey actually slung his Les Pauls onstage. I'm guessing that Page's vaunted 1959 Number One will be next on Gibson's agenda.